Again, depending on Naut’s thoughts his mental state changes and he gets either more insane or calms down, while tumbling through space to his certain doom. 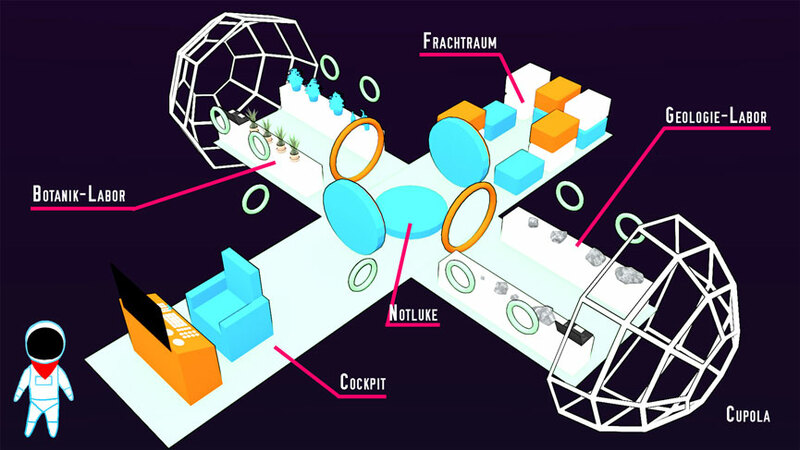 The effects are communicated to the player through body language and changes in the audio and background visuals. For example he can get really depressed. So yeah. Watch out, what you’re thinking about when you’re all alone in space. This one’s actually finished, and one of the earliest animations for the game. As with most of the memory animations I built a 3D model of the surroundings in Blender, animated a camera through the model, rendered the result in 12fps and rotoscoped every frame to get the look you’re seeing now. I’m going for a first person view when it comes to his memories. So I need some kind of reference for perspective distortion, while he’s turning his head. His hands and some additional animations are added manually during the rotoscoping phase. It also helps me visualize Naut’s original environment better. A lot of crazy work, but worth it imho. And that was that for this time! Also, coming up next time: a new character!